The floor mounted hospital surgeon’s xcrub-up unit (Franke model “SSF” ) is available in four standard lengths being 1200, 1500, 1800 and 2100 mm. The two smaller units are manufactured with one outlet and the two larger units have two outlets. 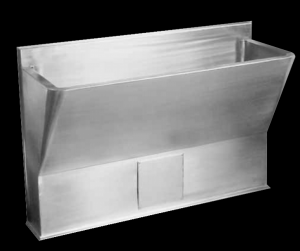 The scrub-up unit is manufactured from grade 304 (18/10) Stainless Steel with a 1,6 mm thick gauge and has a 150 mm high integral splash back to back with radiused internal corners and provision for 40 mm waste outlet/s (Please refer to table below). The front and sides of unit has a double walled construction with the inner wall sprayed with vermin proof bitumastic sound deadening. 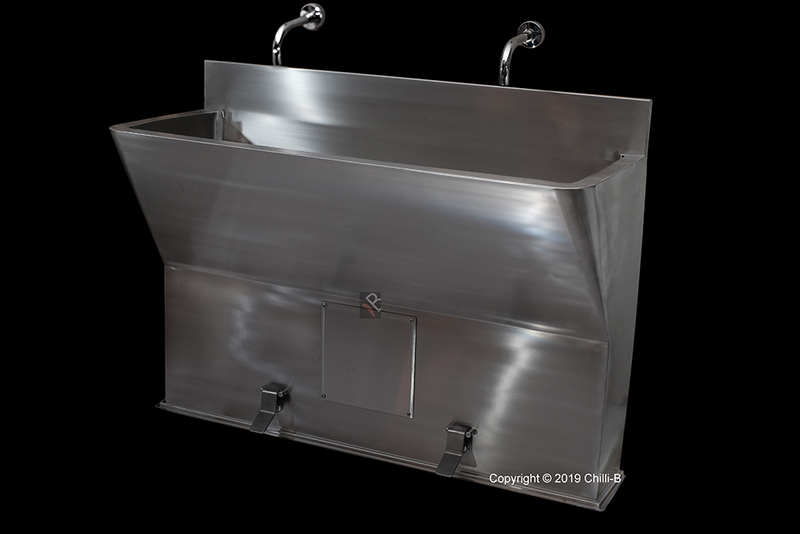 The floor mounted Surgeon’s Scrub-up unit has a 300 x 300 mm removable inspection panel in the front skirting for access to fit the waste outlets in the trough and for maintenance requirements. This unit is fixed to wall and floor with anchor bolts (bolts specified elsewhere). A manufacturing lead time of 22 – 26 working days is required on order. Broen 5235 wall mounted wrist action medical mixer. 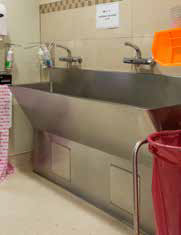 Foot operated surgeon scrub unit. 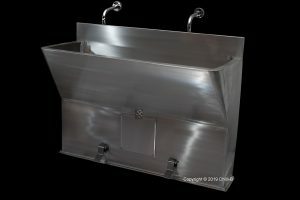 The foot operated hands free medical surgeon scrub unit has industrial metered valves that are activated by foot. The are incorporated into the base of the floor standing scrub unit. 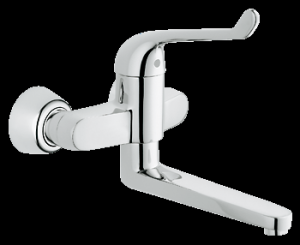 Once the lever is lightly pressed by foot the valves open up and can run between 8-15 seconds depending on water flow and pressure. Hot water is achieved by installing a thermostatic valve (optional). The water from the valves are connected to two in wall basin spouts. Both spouts have aerators to minimise water splashing. Please note: This is a non-stock item. All orders have a lead time of 22 working days. When requesting a quote, please specify the product codes as listed in the tables below. Wall mounted elbow action medical mixer with ceramic cartridge.